#StayWild Tip: Follow a bumblebee. You’ll need to use your eyes and ears to keep up! My garden is a “wildlife friendly” garden, which brings two benefits. First of all, it attracts a wealth of life, from birds and bugs to mammals and wild flowers. Second, its a terrific excuse to be a very lazy gardener. Thankfully, lazy gardening is exactly what wildlife likes – messy piles of leaves, brittle stems left over from previous years growth, and a lawn that is almost a foot high are all micro-habitats that attract a diverse mix of creatures. A wildlife garden requires a carefully cultivated (and dichotomous) sense of care and neglect, and I’ve found a great combination of insect-friendly plants that require very little maintenance, yet come back year after year in abundance to provide for the smallest visitors. 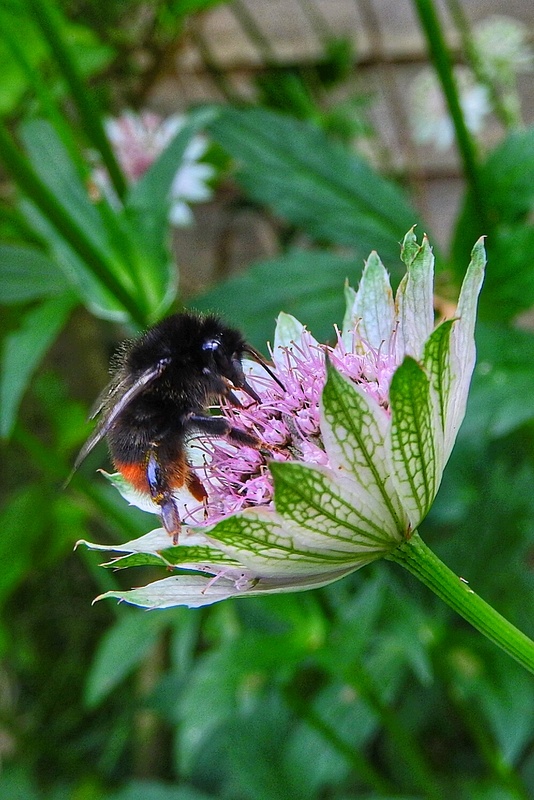 One of the plants I have recognised to be extremely popular with bees and other insects is Astrantia, and for today I sat on the lawn for a while after work and studied the flowers to see what visited. I didn’t have long – only thirty minutes earlier there had been rumbles of thunder, and more rain was inevitable. For now, the sun was shining and the bumblebees and other insects seemed to be making the most of the warmth. The flowers attract flies, beetles and other tiny insects too small for my camera to focus on, and several different types of hoverfly that are too alert and twitchy to permit an opportunity for identification. The biggest attraction are the bumblebees – I counted at least four or five different visitors, and they were far too industrious to notice my lens poking amongst the bracts. I’m still learning to identify the different bees – field guides frequently fail to unambiguously direct the amateur observer toward a confident decision, so if you have a suggestion for the bees below, please do let me know.